There’s no shortage of bar-related/bartender books on the market today, and I’ve browsed through quite a few of them in my search to find interesting new drinks with classic liquors. For a number of reasons – all personal – the Waldorf Astoria has a special meaning to me and so I was eager to give this book a look. And it has become my favorite bar book to date. It isn’t because author Frank Caiafa has come up with all sorts of new drinks, there are plenty of bar books along those lines. This has become my favorite bar book because it does something that I haven’t seen before – at least not without commercial intentions. This book gets specific with the brands of liquor to use in making the drinks. London dry–style gin does add contrast and a bit of spiciness that you may also enjoy. I recommend trying both. That makes sense! All gins are not the same. Just as I’ve been searching for the perfect bourbon for my Manhattans because all bourbons are not the same, it makes complete sense that the gin used will have an effect on the drink. I’ve since looked the “Alaska” up as my wife enjoys this particular concoction, and none of the other versions (it’s not an uncommon drink) mention the brand of gin to use. Any drink I’ve made in here, I’ve paid careful attention to use the brand names as listed to get the best representation of the Waldorf Astoria drinks. While I haven’t made all the drinks in here – I haven’t even made a lot of them – I have selected a few based on my own interests and I’ve found a few new drinks to add to my list of drinks (“Bagpiper” anyone?). I haven’t yet made any of my own bitters (Caiafa recommends this) but I am intrigued and have gotten myself ready by ordering some bitters bottles. I’ve talked this book up quite a bit since getting it and making drinks. This past summer, when friends have come over to sit on the deck with us, I’ve usually brought out a new drink from the Waldorf Astoria Bar Book, which is usually a great conversation starter, and I would talk about the book and why I was enjoying it so much. I know at least one person who received this as a Christmas present because I kept raving about some of the new drinks I was finding here. The book is mostly comprised of the drink recipes, but there is a small section on “Large Cups and Punches” and one for “Hot Drinks” and one for “Historical Concoctions” which was quite fascinating. I’ve been searching for the perfect “Perfect Manhattan” ever since having one in a little restaurant bar in Upstate New York a decade back. I’ve tried a lot of different bourbons and have settled a two or three that make it just right for me, and it was reaffirming to note that Caiafa’s choice was the first one to make my own list. If you have an interest in mixed drinks, you really should get this book. Looking for a good book? 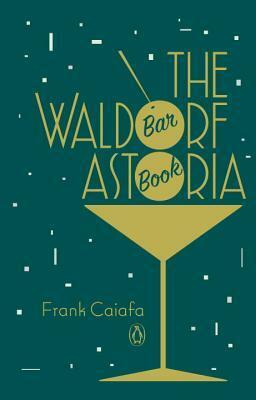 Frank Caiafa’s The Waldorf Astoria Bar Book is packed, not only with drink recipes, but information on how to make each particular drink as best as possible and it is highly recommended.